In every student generation, God has raises up anointed men and women to be His evangelists to the student world. Here is the memoir of one such giant of the 20th century, Sherwood Eddy (1871-1963), who followed on the heels of D.L. Moody, to call students around the world to Christ. In this essay, this YMCA evangelist recalls some of the finest moments from his speaking trips to Russia, to Eastern Europe and to the Middle East. 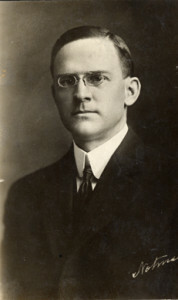 Although unknown to most today, Sherwood Eddy (1871-1963) was a giant in the work of student evangelism a century ago. Through his evangelistic campaigns, he witnessed the work of God on universities for over six decades in Asia, Europe, and North American. As a student, Eddy got caught up in the Student Volunteer Movement which swept some 20,000 students from the West out into the Asia and Africa. In 1896, Eddy went to India to serve as a missionary. For 15 years he traveled throughout India, helping to develop YMCA campus ministries. At the same time he lived in South India and worked among Tamil speaking poor. In 1912, he became YMCA Secretary for Asia and began great evangelistic campaigns in China, Japan, India, Turkey, and Palestine. His numerous trips brought him in contact with many of greatest leaders of that day, including Woodrow Wilson, Gandhi and Stalin. He formally served with the YMCA until 1922. After that time he continued to speak to the university world with searching power and authority. Many consider Eddy the third member of the great SVM “triumvirate,” which included Robert Speer and John Mott. In this essay, you can read for yourself the reflections of his evangelistic ministry among students. It is difficult for students today to realize how impelling the appeal of the Student Volunteer Movement was for us in those days. It was a pledge not easily made or lightly taken. As Student Volunteer bands were formed on the campuses they often proved to be the revitalizing force which united all college life. Schools began to think in terms of the number of their students who were seriously preparing for life in China, Japan, Africa–all parts of the world. College days for us as students were enriched with the constant picture of the future, “when we are on the field.” Forty countries in the world were calling for volunteers, and the “the evangelization of the world in this generation” was accepted as personal responsibility. After I signed the Student Volunteer declaration I began to seek a hundred other men to go with me to the foreign field. Not only did this purpose carry me to the mission field but through the years it made me consistently work for volunteers for mission service among the students of the world. At intervals spanning more than six decades I conducted meetings for the “evangelization of the world” in thirty lands–in every country in Asia that had modern students and in a dozen countries in Europe, as well as in the United States and Canada. Speaking in foreign countries I had to rely upon interpreters and I soon discovered that there were powerful advantages in this method, because every word came “out of the mouth of two witnesses”–the foreigner whose new message the awakened students were eager to hear and their own trusted leader and patriot who as an interpreter endorsed the message. By going over the subject in advance, leaving out all the frills, then giving the message in short, staccato sentences, I discovered that an address which would normally take an hour in English could be delivered and interpreted in an hour and ten minutes. I found that in countries like Russia and China audiences could often be held in a solid grip for three successive hours, although given the opportunity to leave at the end of each hour. In 1911 when the Chinese revolution under Sun Yat-sen temporarily closed the door to the Far East, the Russian student movement invited me to hold meetings in St. Petersburg, Moscow, and Kiev in Czarist Russia. In 1912 we began our tour of Russia at Kiev, “the mother of cities” and the ancient center of Russian history. Though we were not able to secure a large theater, night after night some four hundred students crowded into the largest lecture hall available, many of them standing for two hours throughout the lecture. It was a novel experience to conduct meetings with representatives of a hostile government, police, priests, and ecclesiastical authorities of the Orthodox Church present to scrutinize closely every move we made. Although the priests protested against our meetings, the Governor-General protected us and gave us permits. At the close of the Kiev meetings more than sixty students joined Bible classes. In Moscow we were granted no halls, no permits, no printing privilege, and all meetings were forbidden to us by the Czarist officials. Accordingly we had to conduct our meetings in secret. We obtained two large adjacent student rooms and by standing in the doorway between them we could reach two hundred students a night-a hundred crowded together on the floor of each room. After two hours of speaking we would sometimes say: “We must close for tonight, but we will stay for an after-meeting for all who are contemplating suicide.” Five or ten students would remain and say quite frankly they found life impossible in Czarist Russia and were being driven to the extremity of taking their own lives. I do not ask for blind credulity, nor that you try to swallow all that I have said. I only ask you to make an experiment which is as reasonable and scientific as in the chemistry laboratory: ‘If any one will do, he shall know’ (John 7:17). If you will read through any one of the four Gospels, studying a small portion each day for three months with open mind, and will honestly try to put into practice what you do believe, whatever appeals to your own reason and conscience as true, I challenge you and claim that you will find God a growing spiritual reality in your life before you have completed that experiment. At our meetings in Moscow there was a girl, a medical student, who saw the announcement of our lecture on “The Meaning of Life.” As she stood sneering before this poster she wondered what the foreign speaker could possibly have to say upon this subject; she then decided to postpone the hour of her death at least until the conclusion of that lecture. With many others, this medical student believed that this was a fair test. In the weeks following our meetings, she walked miles through the snow to a Bible class taught by our second interpreter. I learned later in a letter that the medical student finally found God for herself and was on her way to relieve the famine sufferers of Russia. In 1921 I had the thrilling adventure of facing large audiences of awakened students in Egypt, where I worked in co-operation with Samuel Zwemer and William Gairdner of Oxford, with Sheik Mitri as the marvelous interpreter. We had huge gatherings in four centers from Upper Egypt to the delta. In Cairo the newly awakened youth, both Moslems and Copts, filled three meetings in succession each night, as the students often did in China and Russia. Each evening I spoke first in a theater filled with hundreds of Egyptian women; then in another larger theater, the Kursaal, filled with two thousand men, and then in the American Mission Church to students who had come from the two earlier meetings for rapid-fire questions on the particular phase of Christianity on which I had been speaking. Our wonderful interpreter, Sheik Mitri, gave the message with speed and fire in perfect Arabic. Time and again on some moral issue the audience would break into a storm of applause. On the closing night hundreds of men signed cards; during the week over a thousand signed as inquirers. From Cairo we went to Tanta, Assiut and Luxor. At Assiut, in Upper Egypt, we held from three to seven meetings a day for five days. We met in a great tent and by means of a sounding board everyone could hear perfectly. Every morning an average of three thousand attended a Bible class, and on the last morning six thousand Christians gathered. The evening meetings were evangelistic, for Moslems, Copts, and nominal Christians, and the audience averaged six or seven thousand a night. Many hundreds of them signed cards promising daily to read the Scriptures, daily to ray, especially for Moslems, and to seek to win them to Christ. In 1929, eight years after my first visit to Turkey, I went back again and found a new republic in the place of the corrupt and tottering Ottoman Empire. I was able to address not only the students of the Imperial Ottoman University but theaters filled with Turkish Moslem students. What most impressed me was to be asked to speak in a theater to Turkish women students. All were unveiled and many had been released from former Moslem harems. They were studying to prepare for teaching and other professions newly opened to them, or to become homemakers under new laws which for the first time gave women civil, political, and economic rights. In no country in Europe was God more evidently at work transforming lives individually and socially than in Czechoslovakia. In a strange way I was thrown with the students and leaders of this land in two of the great crises of its history. In 1920 the Czechs had their first student conference, after three centuries of Hapsburg tyranny under which no student meetings of any kind on religious, political, or social questions had been permitted. They invited me to come as the foreign guest speaker. I knew enough of their history to realize that I would be facing many ardent young atheists and rationalists, whose only acquaintance with religion was what they had seen of it under the oppression of the church and state of their conquerors. In the museum in Prague I saw the instruments of torture that had been used in the Inquisition in the effort to stamp out Protestantism. It was no wonder that many of them had rejected the only kind of religion, or pseudo religion, they had ever known. Soon after World War I, Huntley Dupre, an American student secretary of the YMCA, had erected as a community center a large building filled daily with four thousand needy students. After months of prayer and planning he had arranged for this first student conference, hoping that there might be founded, in this once Protestant land of John Huss and the early Reformation, a real Christian Student Movement related to churches which were once more free. Our conference was held in an old feudal castle at Prerov in Bohemia. In a daily Bible class we began the study of the Sermon on the Mount. Some of the Czechs had never read or even seen a Bible. Here were atheists, agnostics, nominal Catholics, Protestants, and many who were indifferent or violently antireligious. Almost from the beginning we could see God at work. The Bible came to these young people as a new book, a challenging moral discovery. It was literally like dynamite. We were soon witnessing moral miracles, as students were finding God for the first time in their lives. Nor was their concept of religion a selfish, personal, possessive salvation merely for their own souls in some future life. They had a country to save, a new nation to build, a people to Christianize again and to vitalize in all the relationships of life, religious, social, and political. Then something happened that staggered us as Christians and tested our faith. The students called upon the popular Minister of Education to address the group, and he made in his address a scathing attack upon all religion as reactionary, superstitious, and unscientific. The next day most of the students went out as usual for the afternoon sports and games and then went down to take their plunge in the Elbe River at the end of the day. Suddenly an alarm was sounded–one of them had been drowned and could not be revived. Those students, many of them atheists, brought up that dead body, and now had a problem on their hands. They had to have some kind of funeral service for decency’s sake. Otherwise, the already indignant peasants in the neighborhood would have accused them of godlessness. Fellow students, what have we here in this coffin–only a hundred and fifty pounds or more of flesh? Is there no soul, no God, no life beyond, no hope for this poor boy or his sorrowing parents? Has he died like a dog, ‘without hope and without God’? Must we send home with this dead body the death of all their hopes to his poor father and mother, who have sacrificed for a lifetime to give their boy an education in the university? Or, if there is a God, a soul, a life beyond, a larger, expanding, glorious life into which this boy has already entered, then all things are possible for this boy and for every one of us. He had hastily folded the unfinished letter, thrust it in his pocket, rushed out to the games and then to swim. I cannot describe the impression of that letter upon the students. It was like an electric shock. They felt somehow that this boy was alive and speaking to them, not from that closed coffin but, as it were, from an open heaven. I took as my text for that funeral sermon the closing words of his unfinished sentence, “It is possible.” I said: Fellow students, when I came to this conference, the first that you have ever held in this new republic, I came here in the faith held by John Huss. For three centuries you have been able to hold no such meetings as these, but now you are again free and able to build your new republic. When I put that New Testament into your hands on the first day, because of your prejudice I called it the book of John Huss. I believed that the spirit of your great Bohemian martyr would influence this conference, and that Jesus Christ, once crucified, but now risen and alive forever more, would speak here and raise men who were spiritually dead. I think he has been doing it. I believed that this Bible, forbidden by the church for a hundred and fifty years, would speak again as a living Word. I came to this conference in the faith that not less than twelve of you, like apostles, would step out to rekindle the fires of freedom and of faith in this country of John Huss, in ancient Bohemia and Moravia, the lands of the Christian martyrs. Now I want to ask every student here one question. I do not ask if you are a Catholic or Protestant, a churchman or non-churchman, an atheist or believer, whatever your allegiance, it is possible for every one of you to find God. It is possible to build a new Republic of Czechoslovakia that may some day carry out all the dreams of John Huss which were frustrated or postponed when he has burned at the stake. It is possible to found a Christian Student Movement, to enter into fellowship with the World’s Student Christian Federation where ancient Bohemia may again take her honored place in the religious world. My one question is: “Are you going to be one of the twelve?” It is possible for you. As the boy’s body was carried away that evening in the little YMCA Ford truck, those students who as yet knew no religious hymn sang their Czech folk song: “Good Night, Sleep Well.” On the last day at the closing meeting the daughter of the cabinet member who had cut their faith from under the feet of some of them took the chair. Every meeting in a foreign country whether in Asia or Europe, was an adventure, but so were meetings in the colleges of the United States and Canada. The campus response to religion varies with student generations. Today college students are not as responsive as they were in the period when our meetings were part of the great student movement that included practically all parts of the world. There is a different religious atmosphere now. Perhaps not a less acute concern with spiritual growth, and perhaps an even greater social sensitivity, but the mood is very different from that of the years before America entered the First World War. As I look back over the decades I can now clearly see something which we only sensed at the time–the profound spiritual power generated by the conventions of the Student Volunteer Movement held every four years. The Protestant Church has no spiritual orders calling for vows of poverty, chastity, and obedience such as the Catholic Church has had through the centuries. But Protestant young people have always had the same eagerness to dedicate their lives to a cause that calls for supreme sacrifice. The missionary movement became the cause. When some five thousand of the best-endowed young people of American colleges were gathered in a Student Volunteer convention under the spiritual power, which those who attended could never forget. From these Student Volunteer conventions, as from the day of Pentecost, came the missionaries of the student generation of the nineteenth century–the great missionary century of all time. Lives were changed for all time and history was made for distant lands. This booklet was adapted from chapter four of Sherwood Eddy’s Eighty Adventurous Years: An Autobiography. Copyright 1955 by Harper & Row Publishers, New York. It was reprinted by permission in 1988 by the Worldwide Student Network of Campus Crusade for Christ.